America has a God-shaped hole in its heart, argues New York Times bestselling author Ben Shapiro, and we shouldn't fill it with politics and hate.In 2016, Ben Shapiro spoke at UC Berkeley. Hundreds of police officers were required from 10 UC campuses across the state to protect his speech, which was -- ironically -- about the necessity for free speech and rational debate.He came to argue that Western Civilization is in the midst of a crisis of purpose and ideas. Our freedoms are built upon the twin notions that every human being is made in God’s image and that human beings were created with reason capable of exploring God’s world.We can thank these values for the birth of science, the dream of progress, human rights, prosperity, peace, and artistic beauty. Jerusalem and Athens built America, ended slavery, defeated the Nazis and the Communists, lifted billions from poverty and gave billions spiritual purpose. Jerusalem and Athens were the foundations of the Magna Carta and the Treaty of Westphalia; they were the foundations of Declaration of Independence, Abraham Lincoln’s Emancipation Proclamation, and Martin Luther King Jr.’s Letter from Birmingham Jail.Civilizations that rejected Jerusalem and Athens have collapsed into dust. The USSR rejected Judeo-Christian values and Greek natural law, substituting a new utopian vision of “social justice” – and they starved and slaughtered tens of millions of human beings. The Nazis rejected Judeo-Christian values and Greek natural law, and they shoved children into gas chambers. Venezuela rejects Judeo-Christian values and Greek natural law, and citizens of their oil-rich nation have been reduced to eating dogs.We are in the process of abandoning Judeo-Christian values and Greek natural law, favoring instead moral subjectivism and the rule of passion. And we are watching our civilization collapse into age-old tribalism, individualistic hedonism, and moral subjectivism. We believe we can reject Judeo-Christian values and Greek natural law and satisfy ourselves with intersectionality, or scientific materialism, or progressive politics, or authoritarian governance, or nationalistic solidarity. We can’t.The West is special, and in The Right Side of History, Ben Shapiro bravely explains that it’s because too many of us have lost sight of the moral purpose that drives us each to be better, or the sacred duty to work together for the greater good, or both. A stark warning, and a call to spiritual arms, this book may be the first step in getting our civilization back on track. As brilliant as it is witty, Harry Brod's surprisingly insightful exposé delves into the secret identities of the world's most famous superheroes. 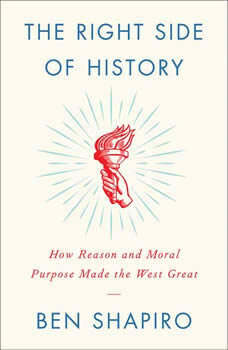 In a fascinating and revelatory book, Robert D. Putnam and David E. Campbell objectively examine the impact of religion on American life and how religious attitudes have changed in recent decades.